31 Dec :When we talk of school, a feeling of completion Flow through in ture spirit. Blooming Buds School at Moga is a dream school. BBS is a co-educational, English Medium, CBSE affiliated school Which is going to be Senior secondary School very soon. First of all as enter the gate a Façade of Flowers welcome you, smiling at you on your both sides as little fairies escorting you to the school . As we pass by, a beautiful blue structure of building appears to be so friendly with its wide open gate which fills you with sense of belongingness. The child may never feel afraid here as the building is built with open and spacious launge in the middle of the rooms. The whole building is filled with natural light and cool air. All the rooms are spacious and comfortably furnished for students. Not only this the whole pre-primary wing in now air-conditioned.The fully furnished air-conditioned computer room with one computer for one child, fully equipped science room, sport room , library with comfortable reading room, new speacially designed and colourful furniture for all classes with all modern audio-visual teaching aids, make this school a complete educational centre with state-of-art facilities which is ISO 9001:2000 certified within a very less record time. For students’ all round development different co-curricular activities also supplement their education. We have various sports activities with complete support of vast playground spread in more than 6 acres of land and material for hockey, football, lawn tennis, basket ball, handball, throw ball , volley ball, cricket, swimming, table tennis, snooker and many indoor games. Very soon students will be enjoying horse-riding and indoor shooting range along with fitness gym . pre-primary section has its own play-ground with modern play station and indoor activity room with more atmosphere, even more facilitated at our school. The school has started clubs this year for different activities such as eco-club , sports club , math club, Arts club , social & cultural club and Music & Dance club to blend and boost education with multipurpose learning . Thus integrated constructive and comprehensive education is BBS. Every year a number of competitions are held in the school top promote such education. 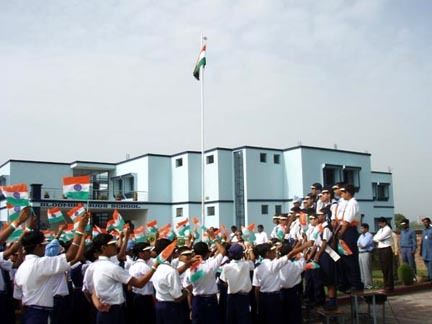 for instance quiz, debates & declamation, paper reading , talent hunt for singing, dancing and poetry recitation, on the spot painting competition, writing and fancy dress competitions are held from time to time to encourage students thus enriching students with self respect and self confidence. Spoken English is stressed in the school campus. The students are learning punctuality obedience and discipline in their day to day life. Moral and cultural, ethics are emphasized. High Merit with character building is our motto. That’s why I said in the beginning ‘BBS is a cherished dreams for every child where parents also feel satisfied and proud to send their ward. Round the clock seurity in through cameras everywhere, providing receipt for every payment also provides of security to the parents. School’s own transport covers 25km radius the school. All this could only be possible as we have a very committed, dedicated and highly learned staff and supportive management Board headed by loving and enthusiastic chairman, Mr sanjeev saini and Chairperson of the society Mrs kamal saini who have given their everything to bring this dream come this school to such a height as it is this day. I personally feel privileged and facilitated to commit the best of the life for such a high dreams set for me. Things are never out of reach,if Your effort is true and comiitted to gain,Uour goal well defined and your steps firmed with devoted spirit,soar high & touch the height as there is no fimit beyond the sky.Once again I owe my gratitude to our supportive chairperson Mrs Kamal Saini & Gen. Secretary Mr Sanjeev Kumar Saini. this school is best in world.i love this school very much. i think it is a best school in moga to study and staff of bbs is so good. This is true and it would`nt be possible without our honourable principal Mrs.Hamilya Rani and our management commitee.